Some Pure Projects brews, in all their sudsy, colorful glory. As of April 4, 2019, the San Diego Brewers Guild (SDBG) has 128 independent craft brewery members that represent more than 150 locations throughout San Diego County. Basically, you could drop a pin on a map of San Diego County and discover a new craft brewery north, south, east or west – and find a place to grab a pint on National Beer Day. If you’re looking to toast to Beer Day at a local craft brewery but aren’t sure where to start, the SDBG suggests downloading the free SD Beer App on your smartphone, where you’ll find an interactive map that shows all SDBG brewery locations across the county, plus beer-centric events. One neighborhood where suds seekers will find various craft breweries located within close proximity to one another is Miramar, affectionately known by locals as “Beer-imar.” There, live fan favorites like AleSmith Brewing Company, Amplified Ale Works, Pure Project, and Duck Foot Brewing Co., to name a few. The SDBG said another suds-centric city is Vista in San Diego’s North County, which currently has the highest amount of breweries per capita in the region (i.e. Mother Earth Brewing Company, Prohibition Brewing Co., Booze Brothers Brewing Co., to name a few). Fittingly, on May 4, the SDBG will host its 2019 Rhythm & Brews Craft Beer and Music Festival in downtown Vista. Of course, you’ll also find there are plenty of deals to be had around San Diego on National Beer Day. Over on Coast Highway 101 in Encinitas, Bier Garden will offer $2 off all beers on tap, all day. The craft beer hub features 32 tap handles of Southern California-made brews, plus a full-service food menu. We've got taps on taps on taps! Some of our current favorites are @pariahbrewingco Dank Drank IPA, @belchingbeaver's Peanut Butter Milk Stout on Nitro, and some other epic beers by @burgeonbeer, @mikkellersd, @eppigbrewing, and more locally crafted brews. Our taps are constantly rotating so come check us out soon to grab these beers! Cheers! In uptown – on Laurel Street about a block away from Balboa Park – The Corner Drafthouse offers 70 local craft beers on tap and will offer select $5 beers all day on National Beer Day. 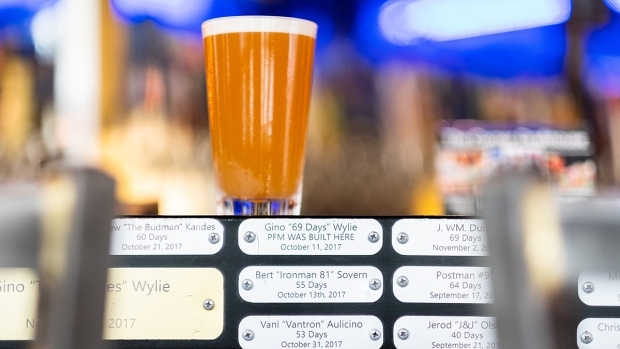 By the way, every day, the gastropub runs its “70 beers within 70 days” challenge, inviting patrons to try all 70 of its beers within 70 days. If you complete the challenge, you get your name engraved on a plaque. The Corner Drafthouse challenges patrons to try all 70 of the gastropub's beers in 70 days. Depending on how far you get in the challenge, you could get your name added to a plaque. Over at JSix, located adjacent to downtown San Diego’s Kimpton Solamar Hotel, you could celebrate National Beer Day with the eatery’s “Sunday Supper Special” – Fried Chicken & Beer – served from 5 p.m. to 10 p.m. Sunday. The $25 dish (served with housemade biscuits and other fresh fixings) comes with the hotel’s new beer, Considerate Gentleman, a classic American lager brewed in partnership with 32 North Brewing Company. Finally, San Diego’s GBOD Hospitality Group – which runs local restaurants El Chingon, Havana 1920, Monkey King, Meze Greek Fusion and Dough Nations – will toast to National Beer Day with $4 pints of the group’s new beer, GBOD Lager. The beer was brewed in collaboration with Mission Brewery, and is described as a cross between a European pilsner and Mexican lager. It’ll be available for that price at all five restaurants on National Beer Day. Of course, this is just a small sampling of National Beer Day deals in San Diego. You’ll have to do your own responsible research to find your true hoppy-ness but, if you’re in America’s Finest City, you’re in the right place for quality beer. Happy National Beer Day, San Diego.